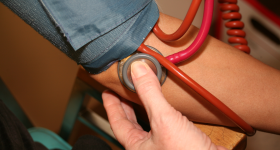 The Will-Grundy Medical Clinic is a not-for-profit 501(c)3 organization that provides free medical and dental care to adults who have no health insurance or medical care entitlements and meet prescribed income guidelines. Tickets on sale now! Join us for this spectacular event! Support our efforts in providing health care to our uninsured or under insured. Please contribute to our annual appeal. Each year around this time, we ask you to “Sponsor a Patient” by making a contribution to help us with this work. Please consider a donation today. No amount is too small. 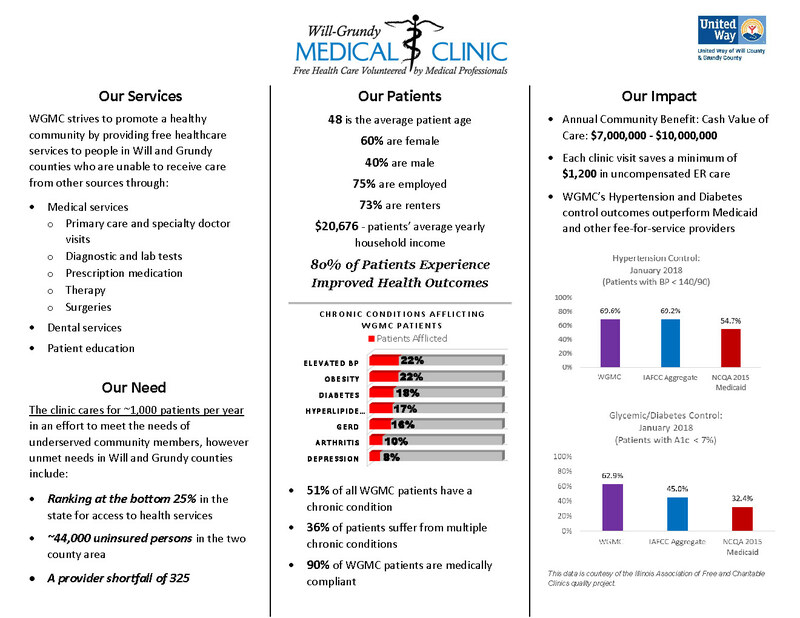 The Will-Grundy Medical Clinic is a not-for-profit 501(c)3 organization that provides free medical and dental care to adults who have no health insurance or medical care entitlements and meet prescribed income guidelines. Care is provided by physicians, dentists and other professionals who volunteer their time and expertise to the Clinic. The Clinic is funded by the United Ways of Will and Grundy counties, our four partner hospitals, local businesses and individuals. We hold three fundraising events and conduct two fund drives each year. Dental and medical personnel offer their services at no charge and the partner hospitals provide millions of dollars of contributed services in the form of surgical suites, diagnostic testing and lab work. Memorial donations can be made to Will-Grundy Medical Clinic. When you click on the "Donate" button, you will be redirected to PayPal. Enter your amount of the donation and select "Secure payment" if you have a PayPal account or Continue if you want to charge directly to your credit card. You will be given on opportunity to enter a name for the memorial before payment finalization. Why Does the Clinic Deserve Support? Our Clinic is the only totally free clinic in the two-county area for those who have no insurance and limited financial resources. How to Apply for Patient Status? Individuals who want to become patients must meet eligibility requirements and must apply for patient status. For individuals that require specialty care, the Clinic must be able to obtain referrals from dentists and physicians who will volunteer their services. (See the Patient Eligibility form). 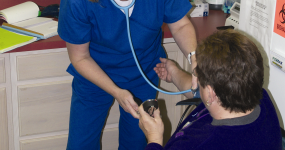 People who are accepted as patients at the Clinic receive comprehensive care based upon their medical needs. 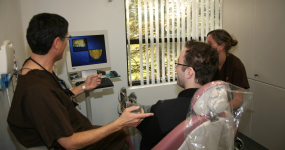 The Clinic provides limited dental services to individuals accepted as patients.